PHILADELPHIA, Pennsylvania, April 25, 2018 (LifeSiteNews) – The fundamental truths about the nature of marriage are under a “diabolical” and “ferocious” attack today, Cardinal Raymond Burke told hundreds of Catholics at Philadelphia’s Cathedral of Saints Peter and Paul on Saturday. The dubia cardinal, known internationally for his strong defense of Catholic orthodoxy and the pro-life cause, was the keynote speaker at a conference titled Matrimony: Rediscovering Its Truth. Catholics came from all over the east coast and as far as California to hear him speak. Upon introducing Burke, the cathedral’s rector Father Dennis Gill said Archbishop Charles Chaput was “personally delighted that someone like Cardinal Burke can join us today,” although the archbishop was unable to come to the conference. Cardinal Burke told the faithful in order to understand the crisis in the Church over marriage, they must consider the relationship between faith and culture, the true purpose of a synod of bishops, the limits of papal and Church power on annulments, the relationship between doctrine and discipline, and confusion about human sexuality. “Those who love the truth and therefore the Church are called as ‘co-workers of the truth’ and living members of the Body of Christ…to do all within their power to defend the authority of Christ [and his] Church. There could be no place for silence or for an attitude of defeat,” said Burke. He explained that the “confusion and error” of some “became evident” for the world to see during the synods on the family that led up to Amoris Laetitia. In 2014, the synod’s mid-point report “made strikingly clear the gravity of the situation” and did not adequately outline Church teaching. He also emphasized that a synod cannot change Catholic teaching by a majority vote. 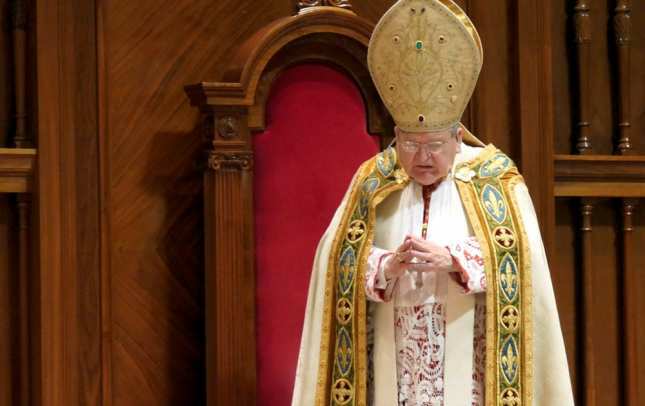 Recently, some have “declared that the Church must update its practice and above all its language in order to address herself effectively to a totally secularized culture,” Burke said as he discussed the relationship of faith and culture. “Yes, the Church should go to the peripheries of today’s culture, but always secure in her identity, manifesting the greatest compassion which necessarily involves respect for the truth of the cultural situation which many times is marked by confusion and error regarding those fundamental truths of human life and its credo, which is the family,” he said. Jesus pardoned them but also indicated “the necessity of leaving a life of sin, the necessity of sinning no more,” he explained. “The Church should not lose its confidence in the natural law inscribed in every human heart and in its full expression in the saving work of Our Lord,” said Burke. Cultural confusion about the meaning of human sexuality leads to the breakup of marriage, “corruption of children and young people,” and ultimately self-destruction. “Disordered sexual activity, sexual activity outside of marriage, and the media’s constant, powerful, and false messages regarding our identity as men and women are all signs of the urgent need of a new evangelization which begins in marriages and families, and through marriages reaches the entire culture,” he said. Cardinal Burke also skewered certain false notions of tolerance and charity that persist in the Church and society. “In the context of charity, tolerance means unconditional love of the person who is involved in evil” but “complete abhorrence” of the evil in which the person is involved, he said. Catholics should look to St. John Fisher, St. Thomas More, and St. John the Baptist – martyrs for the sanctity of marriage – for inspiration and ask for their intercession, Cardinal Burke advised. “Let us follow their example and let us invoke their intercession so that the great gift of married life and love will be evermore revered in the Church and in society,” he said. After Cardinal Burke spoke, conference participants held a Marian procession and prayed the rosary together. Father Dennis Gill, the rector of the cathedral, and popular EWTN guest canon lawyer Father Gerald Murray gave presentations in the afternoon. Like other conference attendees, the cardinal ate a simple boxed lunch of a ham and cheese sandwich at the archdiocesan pastoral center. The day ended with a Holy Hour, Confessions, and an Ordinary Form (Novus Ordo) Mass at which Cardinal Burke was the main celebrant. This entry was posted on Wednesday, May 2nd, 2018 at 4:29 pm	and is filed under News & Commentary. You can follow any responses to this entry through the RSS 2.0 feed. You can skip to the end and leave a response. Pinging is currently not allowed.